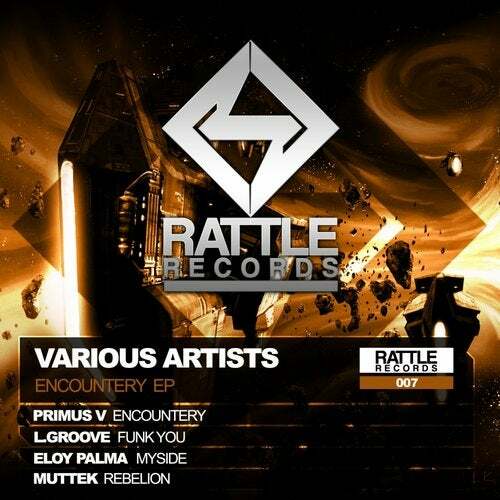 Rattle Records 007 VARIOUS ARTISTS - ENCOUNTERY EP. For our seventh reference we have a magnificent EP containing 4 powerful Techno tracks. The first 2, come from Portugal. The first one and giving name to this reference, called ENCOUNTERY, the great PRIMUS V. The second one comes from the hand of L.GROOVE, with his track FUNK YOU. The other 2 tracks belong to the Spanish ELOY PALMA and MUTTEK with their tracks, MYSIDE and REBELION respectively. Loaded with very strong Hardgroove and surrounded by powerful sound and so much groove is what we will find in this EP.